I am from Pharr, Texas and graduated from South Texas High School for Health Professions, also known as Med-High, in Mercedes, Texas. After high school, I attended UTPA (University of Texas Pan American, now UT-RGV) and graduated with a bachelors degree in kinesiology. I decided to continue my education and attained a masters degree in rehabilitation counseling also from UTPA. I am a Texas licensed athletic trainer and also nationally certified as a rehabilitation counselor. I currently reside in McAllen, Texas and work at Johnny Economedes High School. I have been at Economedes since 2011. I like to remain involved in community work as much as possible, but we all know how hard that is with our jobs. While I was working on my masters degree, I interned at the Red Cross in Dallas with the Mental Health department. I also spent a summer working with Easter Seals and designed a health and wellness summer program for their pre-school and day care center. Currently, I am the Co-chair for the VATA Fill the Helmet Drive and Fundraising Team that gathers donations for the Gridiron Heroes. I have been licensed as an athletic trainer since 2008 but took a break from athletic training to work on my masters degree. I have been in the profession at Economedes for 8 years. 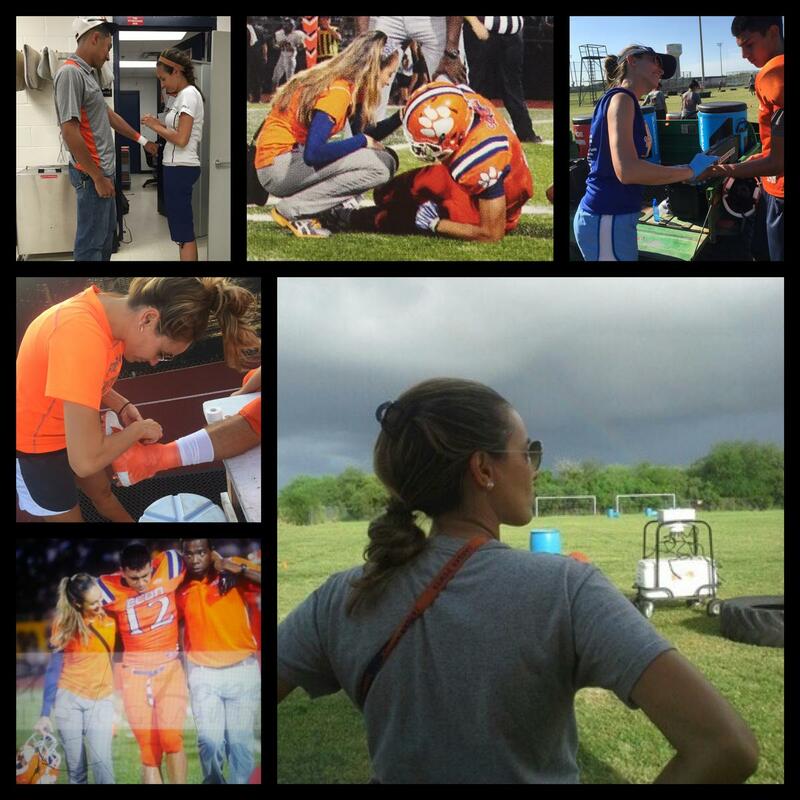 I've wanted to be an athletic trainer ever since I knew what the position entailed. It's always interesting to see the look on student athlete's faces when I tell them that the high school I attended didn't have any sports whatsoever. But that never detoured me from my love of athletics. I learned about athletic training in HOSA and immediately knew it was what I wanted to do. Medical school was not something I wanted to take on, and I also knew that even if I was in sports medicine, I would not be able to work with athletes hands on day after day. Once I looked into how athletic training helps athletes I was convinced it was where I needed to be. I am driven every day by the notion that what I do makes a difference. Our job isn't just about getting that athlete back in to the game; it's about motivating the athlete to be their best and to always strive for betterment of themselves. Working with high school athletes can be very entertaining and I can honestly say that I enjoy going to work- maybe not all day every day, but every day I have something to look forward to at my job. Athletic training has allowed me to travel by giving me a steady and consistent position that has summers off. I see that as a perk of working at a high school. I also was an All-Star Athletic Trainer and got to work the Texas Girls Coaches Association softball game in Austin, Texas. My advice to any AT or anybody really for that matter is to always be true to yourself and remember how important it is to ensure that you are always happy. Make sure to always take care of yourself above anything else. The world of athletic training can be grueling and hard but the reward is infinite.